FlexableIT became a Zoho Partner UK in 2012 recognising that Zoho is the market leader in business applications. 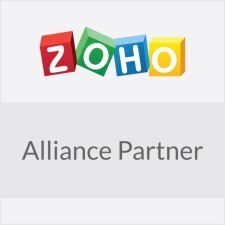 In 2014 FlexableIT were selected from the pool of Zoho Partners to be one of the first Zoho Advanced Solution Providers in the world. 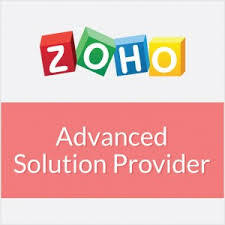 As a Zoho Partner, UK, we work closely with Zoho having near daily conversations.As an Advanced Solution Provider we have an in-depth knowledge of the Zoho portfolio, combined with over five years working with Zoho as a customer (first) and a Zoho Partner later. It is recognised that FlexableIT are one of the leading Zoho Partners, UK. 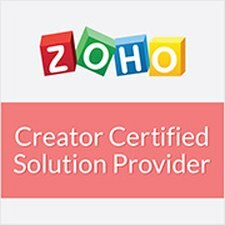 FlexableIT became a Zoho Creator Certified Solution Provider in 2016 after a comprehensive training period in Zoho HQ. The training was delivered by the Zoho Creator team of Product Management, Marketing and Developers. The training consisted of a real world example taking a customer specification, extending and understanding the specification and then building it to a final solution. As part of the process of becoming a Zoho Creator Certified Solution Provider, FlexableIT needs to permanently employ Zoho Creator Certified Developers. This ensures that you as a customer will only have Developers that understand the product in depth. As part of our commitment to the Zoho Creator certified Solution Provider program we have taken a top down approach – any employee from CEO down who is engaged with Zoho Creator projects needs to have Zoho Creator Certified Developer status. As a Zoho Partner all our employees are trained on Zoho achieving recognised certifications as necessary (for example Zoho CRM Certified Consultant). The Zoho CRM consultant program is awarded to individuals and Zoho Partners who have demonstrated a depth of knowledge, understanding and skills to ensure that your Zoho deployment is successful. A Zoho CRM Consultant typically has a breadth of experience in a number of vertical markets. FlexableIT benefit being a Zoho Partner UK by having visibility of new products and product developments, as well as having early access to the enhancements. FlexableIT are directly involved in the testing and development of Zoho Products. We are in a strong position to understand customer requirements and feed them back to Zoho for product enhancements or new product development.